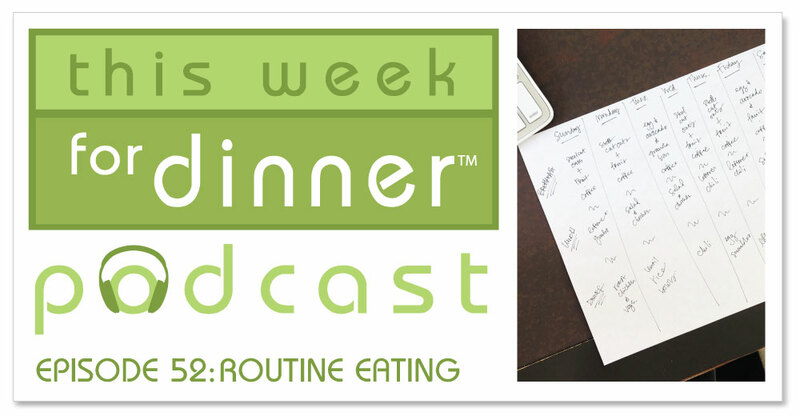 Today on the podcast I’m talking about how routine has increasingly played a role in how I eat over the last year. One year ago I had to change my diet pretty drastically, doctor’s orders. I’ve seen all kinds of positive changes as a result. Once change that I hadn’t really thought about, though, was how my diet has become much more routinized, that there are foods that I eat pretty much every day. I read an article in The Atlantic last week that got me thinking about this topic, and now we have a podcast episode! Listen in to see how routine has helped me with more healthful eating and how it might be able to help you. Via the web: Click the play button below! Via an app: Search “This Week for Dinner Podcast” on your favorite podcast app (iTunes, Overcast, Stitcher, Spotify, etc.). If you enjoy the podcast, please leave a rating and/or review on iTunes! It helps a lot!